The best part on drawing, is not at the beginning or the end but something is often right in the middle, and the same goes for sewing! This little project had its own moments, good and bad, but there was a point just after the sleeves set in, that I knew it was going to work out just fine! I had in mind a few ideas for this coat and in the end decided on a tunic or an over-blouse. 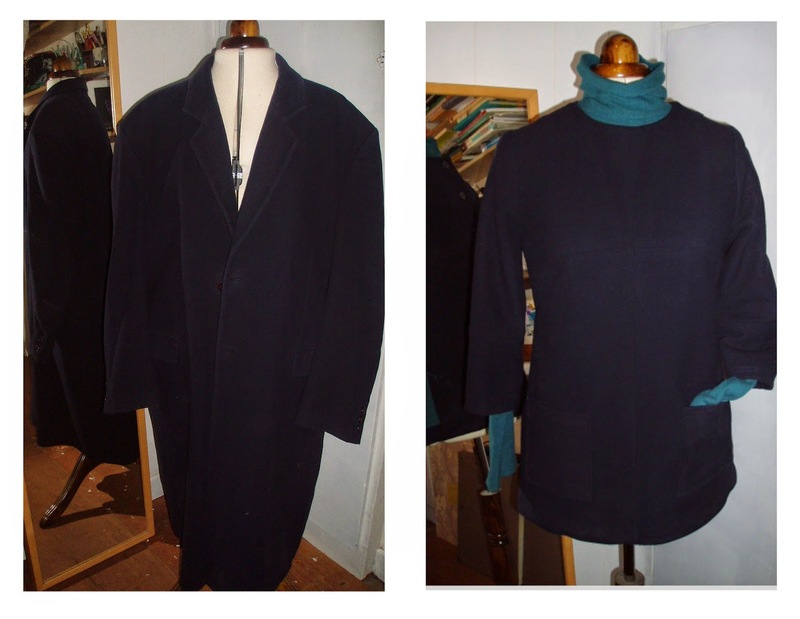 I could have made a coat but as it was a mans coat originally, there was no excess of fabric on the hips, and the shaping darts at waist took away some more options, and I am also concious of going with the cut on wool due to pile. The wool was lovely and although rather old, it wasn’t too worn, just some repairs here and there (which I like to see as it shows that it was a very serviceable item and worth repairing – not unlike my own ancient eiderdown tweed winter coat). 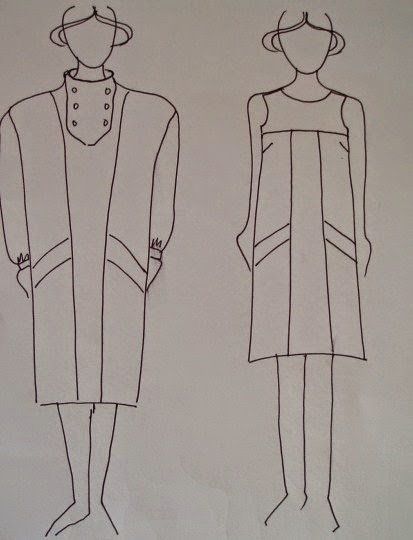 I did some drawings and drafted a pattern and made it up in a cotton which was to be the lining. The whole piece took about a week here and there to draft cut and complete and I put it away each time I was unsure of what to do next. I got a bit flummoxed on how to cut the sleeves and figured the best thing to do at this point make an base-layer for underneath and as these take an hour to make up, at least I would have achieved something that day! 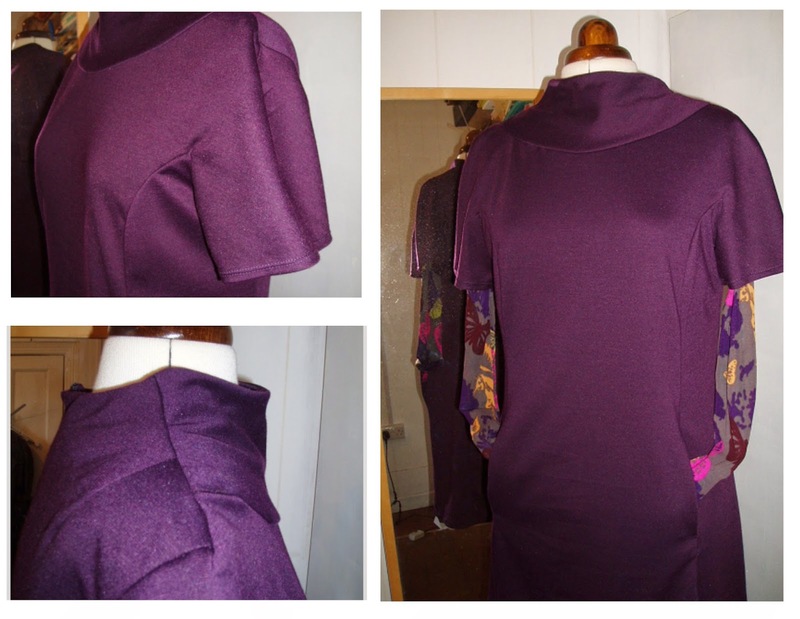 The base layer was made from a cardigan in my wardrobe – love the colour but those front bits get in the way all the time and there have been times I have used a clothes peg to keep them in place when I am working on something – and as a consequence, I no longer wear it, so it was to become a polo neck base-layer! 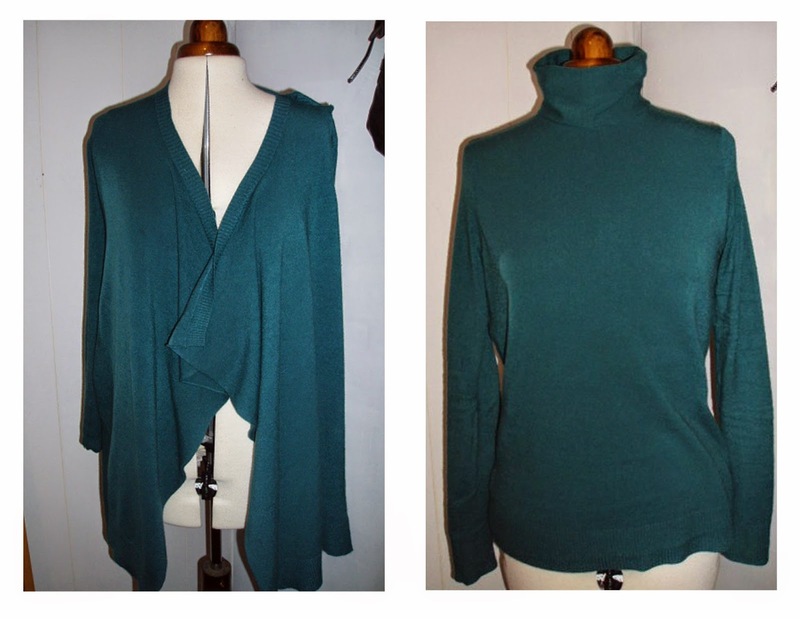 I used my knit-block, set in sleeves flat and put a band in for neck – using pretty much all of the cardigan to make it. The tunic pattern is straight forward. I drafted a light jacket pattern, and then had the shoulder seams shorter than a jacket as I wanted a very fitted shoulder, and tight sleeve-head (I don’t know if that describes it correctly). 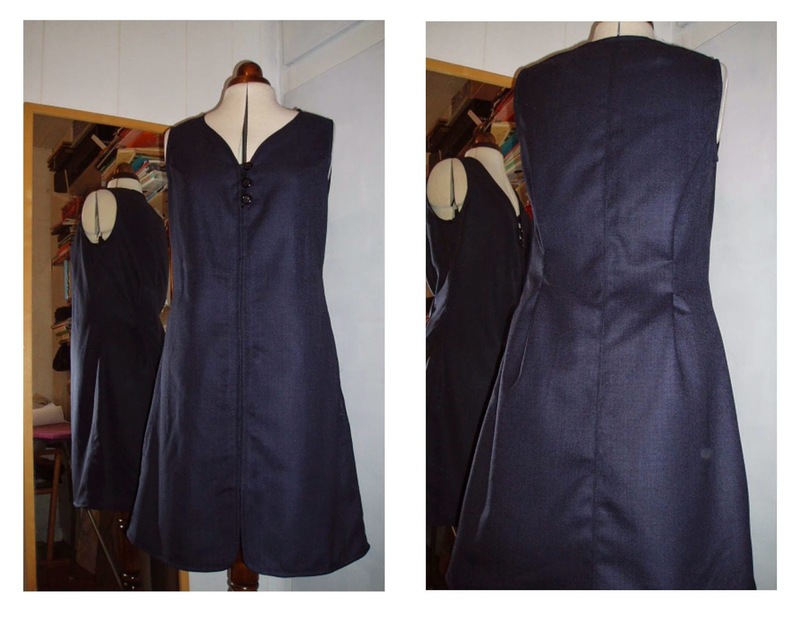 I marked lines where the joins would be preferable on pattern worked the cut from there – the back panel has a yoke and bodice as does the front with a centre front seam. I top-stitched each side of these seams. The front was cut from the front, and back from the back. The facings were cut from facings, and pockets from the coat sides. I cut the sleeves from the sleeves – this was a dilemma for a while but I thought it best to leave it a 2 part sleeve as it was and I pressed and steamed the sleeve as much as I could before laying the pattern over it and cutting. I cut the cuff on the crossgrain with leftovers from the back of the coat. The cuff has a slight flare to it. 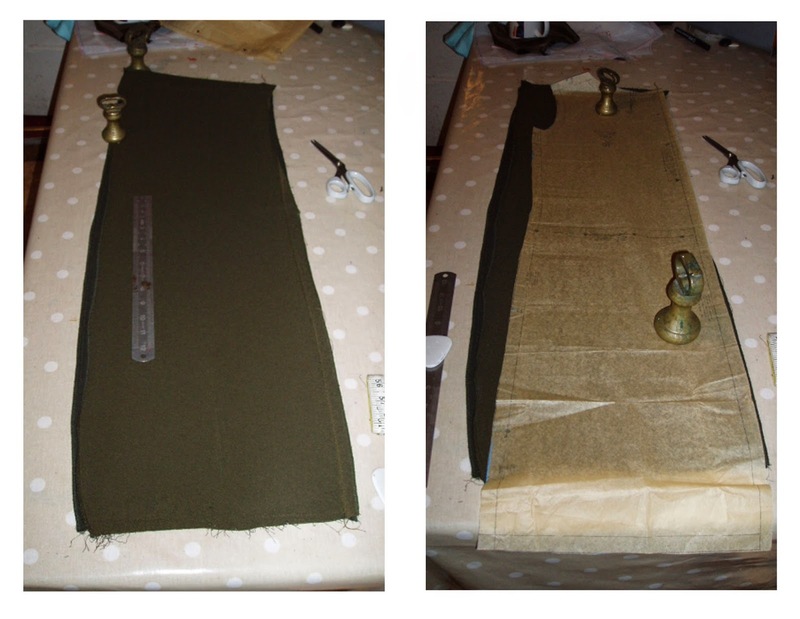 On one hand, the coating fabric is a heavy fabric for the tunic, and ideally it should have been made in a lighter wool with a zip back – however the coat fabric is easy to manipulate and works fine (no way was I trying to put a zip in this either!). For a fitted piece, there is easy movement (I chopped some logs to check), which means it will work well as a ‘work tunic’ and as a mid-season jacket. 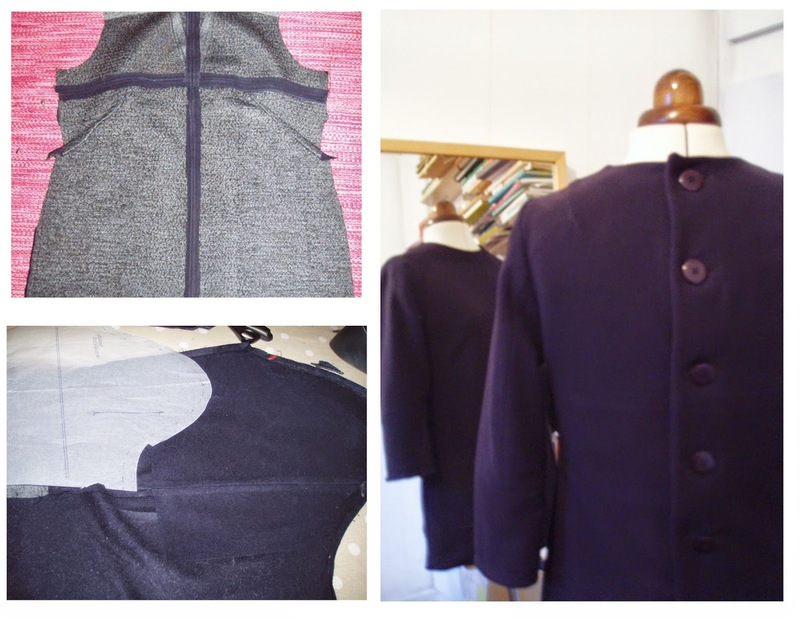 I am so pleased with the tunic – it is incredibly warm, and such a practical item, and the pockets are a bonus. Gold stars all around. I finished this dress a few weeks ago and love it. I didn’t post it till today, as I was trying to get the others finished before as it would be too tempting to leave them as they were (red dress). I was a bit frustrated after none of my three dresses turned out to be ready for Christmas day I ended up wearing the sweater dress I didn’t want to wear, and I ended up pulling at it all day (it never sits right)!, so a dig into stash was in order to get a dress made for my ‘Second Christmas’ (which is the few days I spend with my sister in Dublin after the 25th but before the 6th January) and hope I could stretch this double knit to a Pauline Trigere Dress (I did and there is even a piece left over). I had been looking to adapt this pattern for an upcycle a while back and it was a bit complex looking so it went back into envelope. It was probably just as well I didn’t think too deeply on it, and just cut it out and sewed, as it was a tricky one. The first one was putting on the facing, and then applying collar (the facing is put on, and basted in place, the collar is sewn on the front and the stitching line is about 2 inches down from the neckline underneath) – everything seemed to be foreign territory but I kept going and luckily choosing double knit, meant there were no seam finishes to worry about. When it came to putting it all together in the end, I made up the lining first, and figured it out from that. The sewing of the dress itself is a bit rushed but I am very pleased with the dress and if I had to do it again, it would be far easier – and I would probably sew it a lot neater! One or two steps of easing, could have been skipped due to my using double knit, but I didn’t take the chance, and I should have done the gusset ‘my way’ as I seemed not to ‘get’ the instruction sheet. I made the dress shorter than the pattern. I did make it to pattern to see what it was like, and it was very (incredibly) dowdy, so I shortened it by 8 inches or so, to an two inches above knee. I used an 8inch zip from my zip collection (all zips put into a box when I take upcycles apart) and its a grey colour but not too noticable. I could not find a zip to match fabric so this concealed zip will do fine. I love the dress – and even though the sewing is shamelessly rushed, I am quite happy to overlook that. The pockets are a bonus, and the dress in incredibly comfortable and personally I think flattering. I did have to take about an inch from the back seam as it the fit of this pattern was very generous – and if I ever see the right fabric, I would try this dress again. The turtle neck is lovely but I have to be careful when I wear a cardigan (we have a cold house) over it as the back collar sticks up, so its a case of making sure the cardigan is not pulled over. It works well with a favourite patterned baselayer that hasn’t been worn in a while and it works well with my boots – should have made this dress first! When I saw this red dress, I couldn’t believe how fine the wool was, and I deliberated for a long time as there were so many bits. I normally avoid pieces with too many seams as it’s a compromise from the get go. So I took out my little muji measuring tape and still though the strips of red – measuring about 25cm wide each was too small, and although the sleeves contained more fabric, I still went ahead an bought it………. it was the lovely wool. I placed a good few patterns over it – but not enough fabric, so I decided to make a simple shift and work pretty much with what was there. I had originally thought to work in some strips of orange fabric or pink worsted wool scraps I had, but as there was a bit of topstitch detail already, I figured I would leave it at that. The before picture is a bit dee-sasterous looking, very difficult to see the red clearly, so I have a drawing below with the before after as this shade of red and my basic camera seem to just blur it all. I took the front apart so I could turn the middle panel the other way to get the wider cut (bringing the 80’s shoulder fabric content down to the hem), and still keep the pockets. 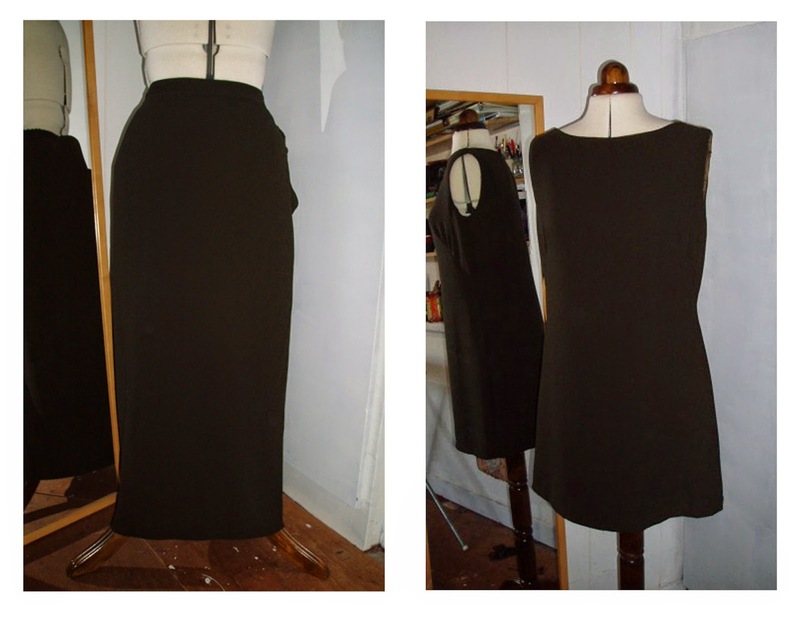 I should have realised that the wool was stretched when I was cutting the dress out and I should have steam shrunk it then (see first photo below) but I left the side panels as they were. By the time I was sewing the side panels on I was questioning my reason. 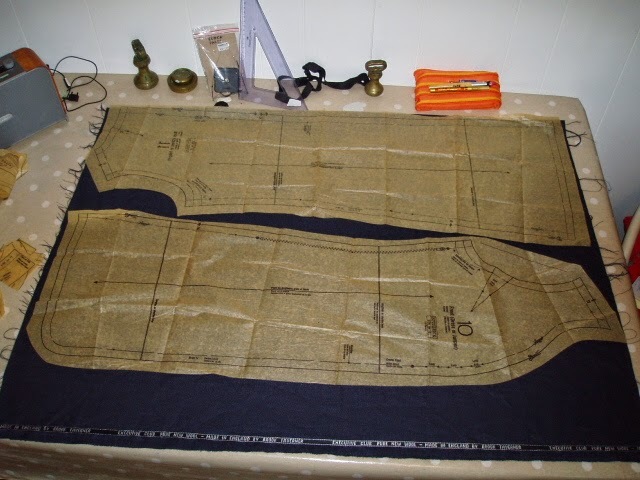 The pockets would not line up – I sewed and resewed far too many times before I got the measuring tape out. I really could not understand how I lined them up and they would then ‘look’ so wrong. 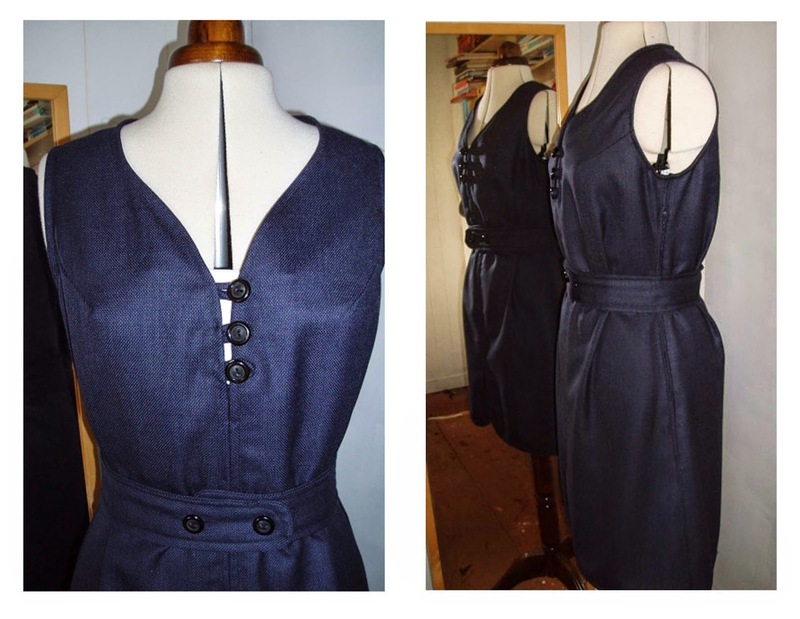 It turns out the pockets were never even on the original dress – and my best bet was to have the top of the lhs one a bit higher making the bottom of the pocket a bit lower so its balanced – hard to believe I never saw it to begin with, I had to take a photo to show. By this stage I was beginning to swear a lot, and when the whole piece was together, I was in continuous swear mode….. the stretch in the wool was everywhere and draping where it shouldn’t and the whole re-made well-made seemed a bit silly. I had hoped for this to be my Christmas day dress – ho ho ho – like that was going to happen – however, I really liked the overall shape and proportions. I figured I would leave it till January to see if it could be rescued and this in itself would be better for my sanity. So last week I undid both seams to check grain, and the lhs was slightly off so I straightened that, and then, I decided to try and steam shrink with a hot iron and let the fabric rest and cool, and it seemed to do the trick (well improved it a lot)! its still a lil’ bit uneven – however, its also finished, will be worn and pattern most definitely used again! Generally when I buy fabric, I go to either Murphy Sheehys or TWI fabric wholesalers in Dublin. TWI is a little bit ‘out of the way’ from the city centre, but it has a great selection, it’s at the rear of a Georgian house in a Georgian square and is a maze of alcoves, corridors, and one large warehouse room of fabric. There is a huge pile of remnants in the big room and the last time I was there I got three lengths of wool suiting for about 10euro. This was one of the pieces and measured 60inch x 41inch (please excuse my inch and centimetre changeovers, I sew in inches and pattern draft in centimetres, and measure myself in inches – I think its a result of sewing in school where it was all imperial, and then pattern drafting is more accurate in centimetres). While this wool is a lovely quality, but rather a sober colour and it has languished in stash for about a year. 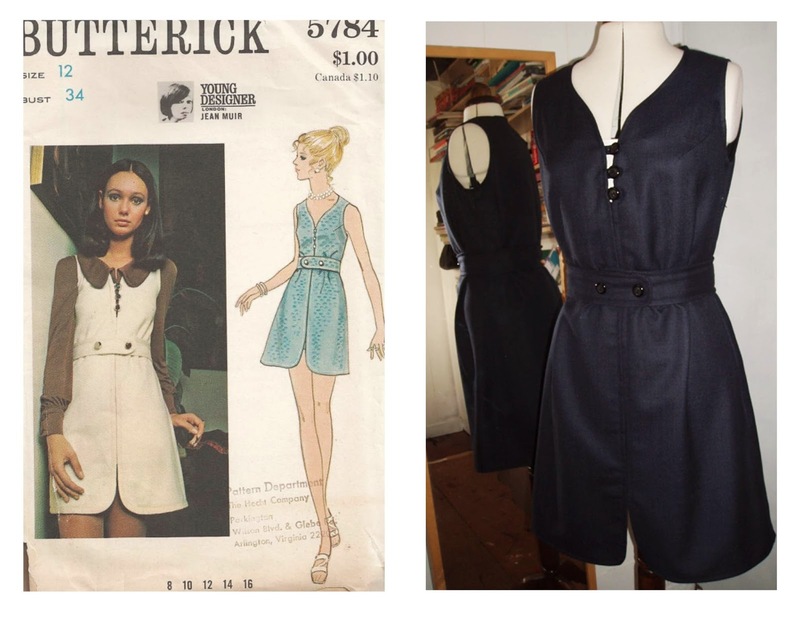 I wanted to try this Jean Muir pattern, and got the whole cut from this piece – win win. 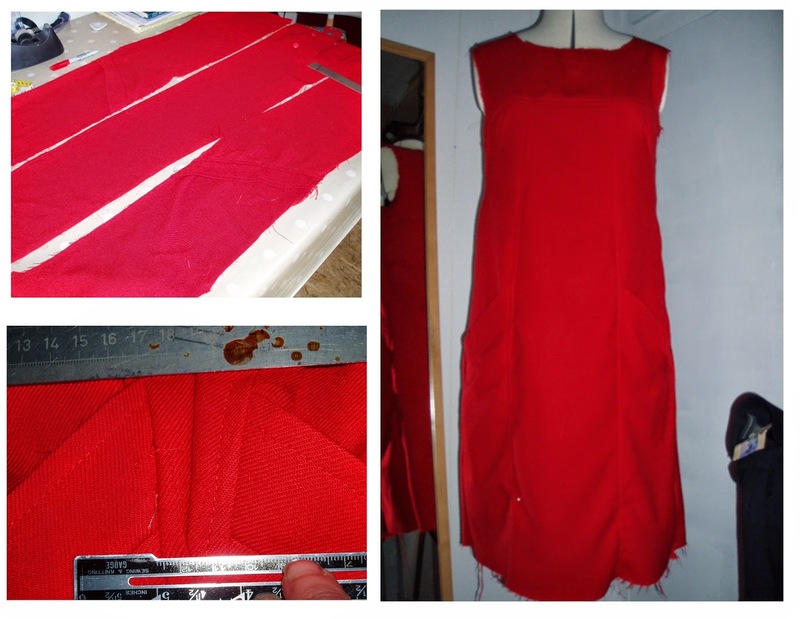 The sewing of the pattern was relatively straightforward. But as usual I steamed ahead without checking instructions fully and top stitched each side of the seam closer to the seam than pattern recommended (1/8inch – pattern 1/4inch) but I wasn’t going to undo it either. Part of this current sewing frenzy is for me to cut out my over-the-years-short-cuts (read bad habits), and for the most part I have been a bit more patient in my sewing. Also, as I have often drafted my own patterns over the years, (again, I have also gotten into some short-cuts here, so I am now drafting a new set of lovely blocks on card….. ) I have also not sewn in a proper sequential manner, which is why I am trying to slow down and read instructions – doesn’t always work. I left dress length and everything else according to the instruction. The length is good (just above knee), but way different from front of envelope! which shows it much higher. I love the hemline. The buttons are very plain, but they are from the button tin (sometimes I think I come from a long line of button collectors…..). The dress is not very shaped at waist, and when the belt is put on, it looked a bit like a pulled in sack, so I put two (temporary) tucks at back to control the fabric which did and didn’t work so I undid them. I am still undecided on the dress, and I think its the shaping, or lack of, but I will wear it over the next few weeks and decide. If all comes to all, I know it has the makings of a good skirt, sometimes I think, the more I sew, the fussier I get! I know that I started and am now finishing 4 dresses in December, and am surprised at how critical I am of each (although the Trigere one I am finishing now looks like the winner). One reason I am making these dresses is the main winter dress I had last year is a rtw sweater dress which doesn’t suit my shape, and when I wear it I seemed to be always pulling at it, – but it did suit my favourite winter boots, and I had decided this year not to wear it anymore, and work on something that would suit me and the boots! 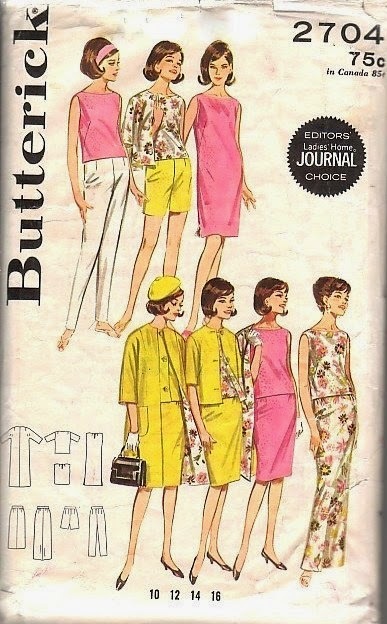 The nice thing about the pattern was the simple and effective cut, and while I was doing the dress, I was browsing the blouse pattern which is now on the to-do list……. For a few reasons, I seem to have spent much of December trying to make winter dresses for myself. I have a pair of brown boots I love but little to wear with them, so I figured I could run up some tunic dresses and have a great selection to wear within weeks, how wrong I was. Between one thing and another, none of the dresses seemed right. 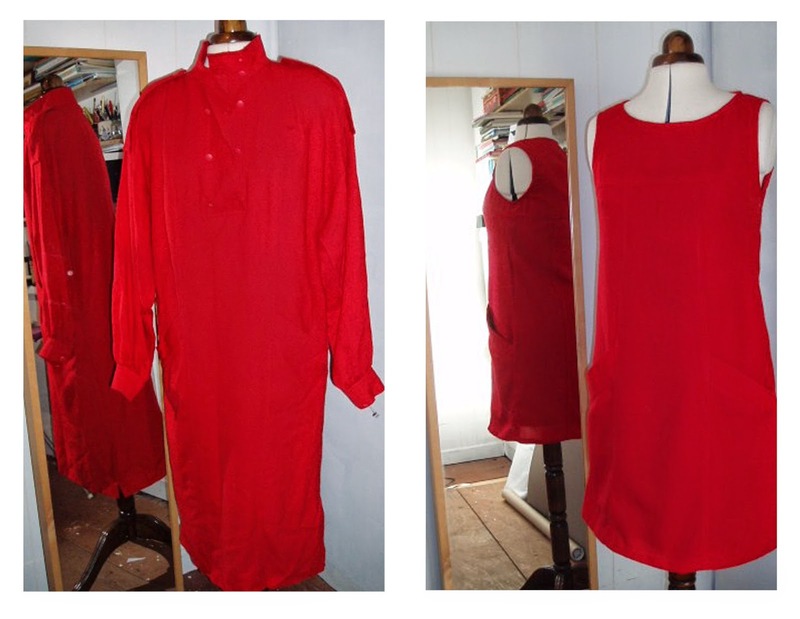 I wanted a dress or tunic that was semi-fitted, comfortable, and that would work with knee high chunky leather boots, and my body shape…..and that would be fab, so it became a month of trial and error. It now looks like January will be a month of tweaking the nearly done flawed other dresses before I can get onto another coat remake. The first skirt was a polyester cupro, great weight, and the colour was a bit dowdy, but I thought I could figure something later. I used the butterick beach dress and made it shorter. The skirt was taken apart, and the side seams went out for hips, and in again – in a lot more than the waist width – probably to keep the line of skirt tidy, but I didn’t anticipate the loss of fabric here. (the skirt is a uk size 18, I am a 12/14). 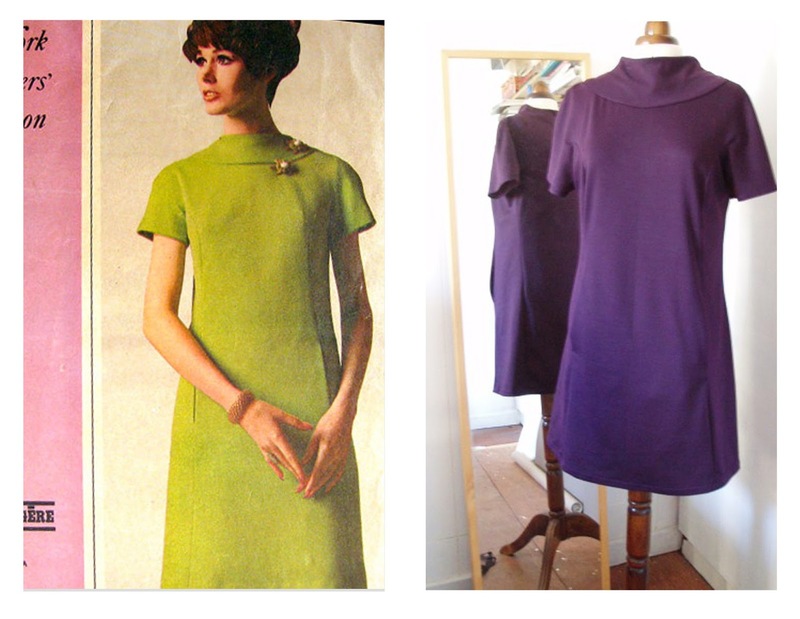 The dress pattern neckline is at the skirt hemline in the photo. I was able to make the hips marginally bigger, and the overall length of centre front neck is 84cm, so a bit above knee. I had made the dress before from cotton, and it was incredibly quick to run up. In the photo, and on mannequin there is a drag of fabric above darts but this isn’t evident on when wearing it(?) – I am hoping its the fabric as it didn’t happen with the cotton version. I am not 100% happy with the balance of the tunic. Where the dart ends’ the waist shaping begins and it seems to cut the line the dress in half and makes it look a bit dumpy (as it is made shorter than the pattern is ). I am probably being over critical, I have worn it, and its comfortable, and has shape, so thats 2 out of 3. I will consider applique trim of another colour for neck and hem if I come across an appropriate shade or fabric, but not until the other dresses are got to a finished state……………….